With over 30 years’ experience of risk management in banks, Mark Laycock provides a comprehensive but succinct non-technical overview of risk and its governance in financial institutions. 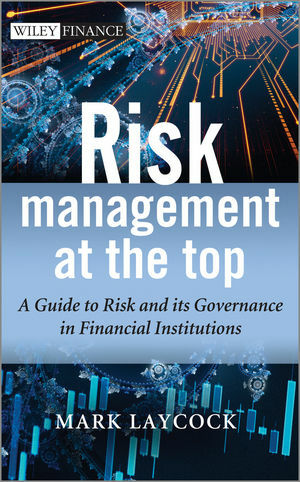 Bridging the gap between texts on governance and the increasingly technical aspects of risk management the book covers the main risk types experienced by banks – credit, market, operational and liquidity - outlines those risks before considering them from a governance perspective including the Board and Executive Management. Addressing terminology issues that can confuse dialogue, and by providing a bibliography alongside each chapter for more detailed discussion of the topic this book will ground readers with the knowledge they require to understand the unknown unknowns. Mark Laycock has experience across the risk disciplines that attract regulatory capital. He is highly regarded within the Operational Risk discipline. He began working on Operational Risk in 1998 whilst at Deutsche Bank, which he joined in 1996. In 1999 banking regulators wanted an explicit capital requirement for operational risk. He worked with several industry groups developing practices and helped to establish the Operational Risk Data eXchange (ORX) in 2002. His involvement in Market Risk spans a decade from the mid-1980s. He was also a trader of Fixed Income and Equity strategies, such as equity index arbitrage. The later part of his Market Risk decade was spent at the Bank of England, Banking Supervision Division. Since 2008 Mark has worked for ORX on topics such as the categorisation of Operational Risk, Scenarios and Operational Risk Appetite. He also has a consulting company Alder Partners. Mark has an MBA, from Manchester Business School, where his dissertation was on Maturity and Interest Rate Mis-Matching of Banks.